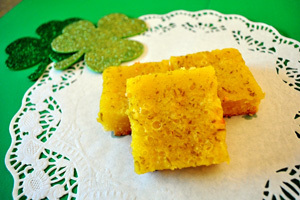 While most people are trying to figure out how many Irish pubs they can hit in one day and how many glasses of green beer they can actually ingest, why not skip the hangover and figure out how many green desserts you can make for St. Patrick’s Day instead? St. Patrick’s Day is right around the corner and that means it’s time to pull out the Guinness and the Irish whiskey and start lining up at 9 a.m. at all those Irish bars around town. 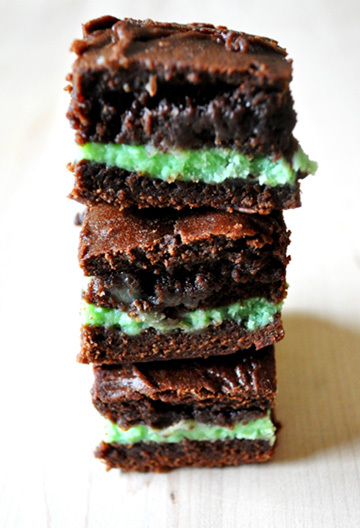 But if you’re someone like me who’s over the whole getting plastered thing just because it’s St. Patrick’s Day, why not fill up on green desserts instead? You can still have a pint of Guinness with that delicious corned beef and cabbage dinner, but you’re going to need something sweet to tie the whole evening together. An even better option? Have a few people over for a party with nothing but green desserts and some Irish coffee. But if you haven’t got any ideas of what to make that’s sweet, green and not mint chip ice cream, don’t worry because I’ve got you covered. Whether you’re craving an alcoholic kick, something tart or something you can make with the kiddies, here are three dessert recipe options so you won’t have to choose. Preheat oven to 350 degrees F. Grease a 9 x 9-inch baking pan and set aside. Melt the butter and chocolate in a small pan over a low flame. Pour the chocolate mixture into a large bowl. Mix in one and a half cups sugar. Add four eggs one at a time, mixing after each one. Add the vanilla. Gradually mix in one cup of flour. Spread half the chocolate mixture into prepared baking pan and set aside. Melt the white chocolate chips in a double boiler and stir until smooth. Transfer the melted white chocolate to a medium mixing bowl. Add one egg, 1/2 a cup of sugar and 1/4 cup of flour and mix until smooth. Add as many drops of food coloring as you like to the white chocolate mixture and mix until you reach a green shade you desire. Spread this white chocolate mixture over the dark chocolate mixture already in the pan. Top with the remaining dark chocolate mixture and bake for 40 to 45 minutes or until a toothpick inserted comes out with just a few crumbs on it. Let the brownies cool for 10 minutes in the pan. Transfer to a wire rack and let them cool completely. Slice the brownies into squares and serve with some Irish coffee. Cream the butter and 1/2 cup of sugar together until they’re a pale yellow. In a separate bowl, combine two cups of flour and salt. With the mixer on low, gradually add the flour mixture until just mixed together. Press the dough into a 9 x 13-inch pan and chill in the refrigerator for 30 minutes. Cook the crust for 15 to 20 minutes or until it’s light brown in color. Let crust cool, but leave the oven on. While the crust cools, whisk together the two cups of sugar, lime zest, lime juice and eggs. Gradually add in 3/4 cup flour until well-combined. Pour the lime mixture over the cooled crust and bake for 30 to 35 minutes or until lime is set in the middle but still jiggles, kind of like a jelly. Let cool for 10 to 15 minutes, cut and serve. Dissolve the lemon Jell-O in two cups of boiling water. Stir in the condensed milk and pour into a 2-quart plastic dish. Chill for at least four hours or until firm. Using a circular cookie cutter, cut out as many “coins” as you can and place them in a 9 x 13-inch pan. In another bowl, dissolve the lime Jell-O in two cups of boiling water. Stir in one cup of ice water and let cool. Pour cooled lime mixture over lemon “coins” and chill overnight. 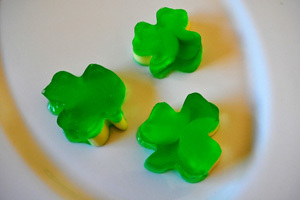 Using a shamrock cookie cutter, cut out the Jell-O and serve.